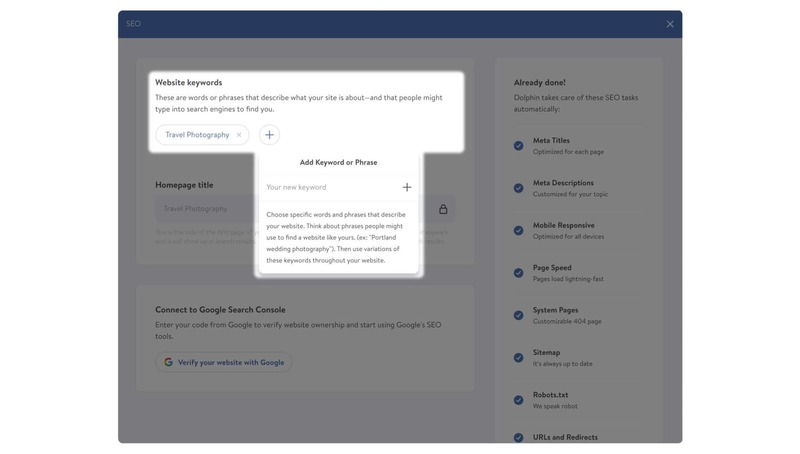 Now you can start using a whole new set of SEO features that make search engine optimization easier and faster than they’ve ever been. Search engines like Google are huge traffic sources for business websites. But for years I’ve seen people shy away from SEO because it seemed too difficult. And they’re right, it was difficult. Even if you opened up your settings, it was hard to be sure you were doing the right thing. That’s why I think you’ll really like this new way to manage your SEO on Dolphin websites. It takes care of most tasks automatically—tada!—or it pinpoints exactly what you need to do to and shows you how to do it. You check off all your SEO boxes quickly and confidently, with no more guesswork. Having access to a lot of manual SEO settings is great. But having those settings done for you is even better. Now, Dolphin takes care of some of the big SEO housekeeping tasks automatically. Instead of telling you to create a 404 page (and learn what one is, first), it makes one for you. You can edit it if you want, or leave the original in place. Same goes for mobile optimization, accessible URLs, sitemaps….it’s all there. Eight different ranking factors are ready right out of the gate to keep search engines happy. Open the SEO settings, and choose three keywords or phrases that you want to target. Then, our smart system will scan your website and make sure those keywords appear in the right places and recommend other ways to use them. Now it just takes a step to tap directly into Google’s powerful SEO dashboard. Hook up your website to your free Google Search Console account and verify your site ownership. Then see your site through Google’s “eyes” and optimize it accordingly. 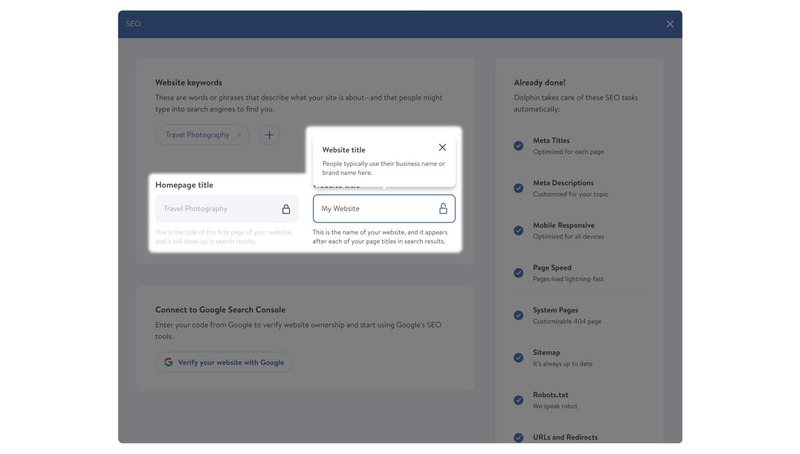 If you want to adjust how your site looks in search results, you can now set your own homepage title and website title in just a few seconds. That way you can target certain keywords and help search engine crawlers understand what your pages are about. Dolphin’s new SEO system is a diagnostic tool too. It will point you to the exact area of your website that you can improve, and tell you how to fix it. Broken links? See exactly where they are. Too many headings? Here’s how you can streamline them. Don’t know what a heading is? That’s fine too. Dolphin walks you through it. These new features are meant to do the heavy lifting for you, so you can step back and enjoy the ride. That way you give your site the best chance of showing up in the right places, and in front of the right people. Looking to try it out on your website? Upgrade to a Dolphin Start or Grow package now!